The Red Tent or Moon Lodge is simply a gathering of women that occurs at the new moon when girls & women are most in need of support, rest & reflection. This is a timeless tradition observed by ancient cultures which serves as a regular forum for empowering women’s sense of selfhood. This includes understanding the effect of the lunar & seasonal cycles on our emotions, energy levels & psychological states & how to create balance in all three with a cyclic approach to self care. This ‘Secret Women’s Business’ empowers women of all ages to honour their bodies as temples & make self-honouring choices. The ancient custom of initiating young women when they begin their fertility cycle into the monthly gathering of older women supports them through the natural process of individuation from their Mums. Without this transition being formerly marked & young women being afforded a larger circle of support this can be a tense time behind closed doors with teenage girls rebelling against their mothers in order to assert their own feminine identity. Initiating teenage girls into a circle of trusted older women provides them with a network who they can turn to when they need guidance, rather than being blindly led by their peers or seeking guidance from magazines sponsored by a corporate agenda. This provides an authentic foundation of practical support so they can make the necessary errors in judgement that are universal on the road to wisdom. This is a safeguard that is even more pertinent in our modern world which preys upon the naivete of young women and their need to be liked & affirmed as sexually attractive. Welcoming girls to their womanhood affirms being a woman is worth celebrating & that it is safe for us to gather & speak our truth. Marking this rite of passage also helps both mother & daughter to acknowledge that the childhood phase has passed so new responsibilities must be accepted if new freedoms are to be granted. Knowledge is Power. When women take time to connect with their inner most thoughts & feelings they can better respond to their needs. 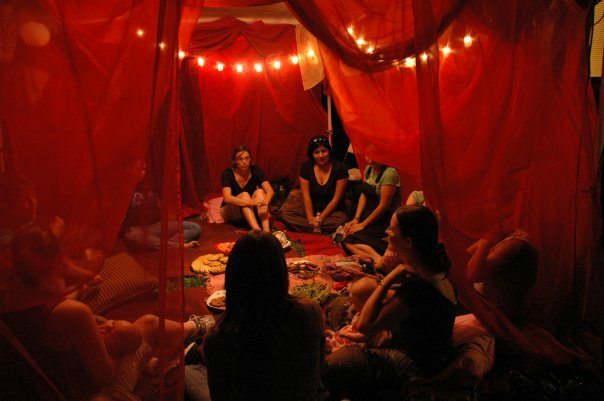 The Red Tent was also where women learnt the sacred arts of healing, channelling, dream analysis & divination on the understanding that our inner senses; clairvoyance (clear seeing), clairsentience (clear sensing), clairaudience (clear hearing) & intuition (inner guidance) are amplified when we gather in alignment with the moon. By honing these inner senses young women develop the skills to discern potential danger & avert it by learning to read the signs. It was in the Red Tent women’s deepest secrets were shared so no woman had to carry her burdens alone. Wisdom was also imparted through the oral tradition of storytelling that provided an archetypal framework for growing beyond our perceived challenges. The Red Tent was a safe & supportive environment where young women learnt about the responsibility of their fertility cycle the importance of their role as women in society. New moon is the time of the month, 2 weeks after full moon when we tend to feel tired, inward & vulnerable. It’s when our insecurities & old wounds surface… so we often retreat from others. If we don’t accept & heal our shadow we don’t mature so we fear ageing and make immature choices that create drama in our lives. It is for this reason women of all indigenous societies for thousands of years gathered together at his time to reflect upon their lives, offering each other emotional support & healing. This takes the pressure off partners to ‘make a woman happy’. By taking responsibility for our emotional well being through a monthly practice we also lessen our need for emotional comfort through overeating, as the sacral energy centre which resides in the abdomen is governed by the moon. When women don’t honour their emotional needs the result is gluttony, as the inner child attempts to self soothe. The new moon is also the time when most women experience their ‘moon time’ or ‘heavenly water’ as it was known in traditional Chinese medicine. 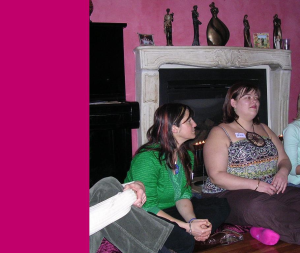 So this custom offered a time out for women, enabling them to turn inwards & rest & replenish. The omission of Red Tents means many modern women don’t take regular time to process their emotions so we see eating disorders as common place, particularly amongst teenage girls. Other feminine health complaints such as menstrual disorders & depression are also often alleviated through this simple, cyclic practice. Without this cyclic acceptance of our need to give back to the self women burn out by over-giving in accordance with patriarchal expectations of a ‘good woman’. This is symbolically illustrated by the Western epidemic of breast cancer in the ‘civilised world’ where women are culturally expected to nurture 24/7 without asking for anything in return. Just as we need to breathe in before breathing out, so too women need to take time & sustenance for themselves if they are to sustain their output.